If our champ continues his rampage tonight, I might have to start talking about Streaks of Virility. John’s got numero quatro locked up – and these scores make things pretty easy for me. John has it locked up; he can wager up to 5,599. A successful doubling will put Abbie at 6,000. To cover this, Jeremy should wager 800 and no more. 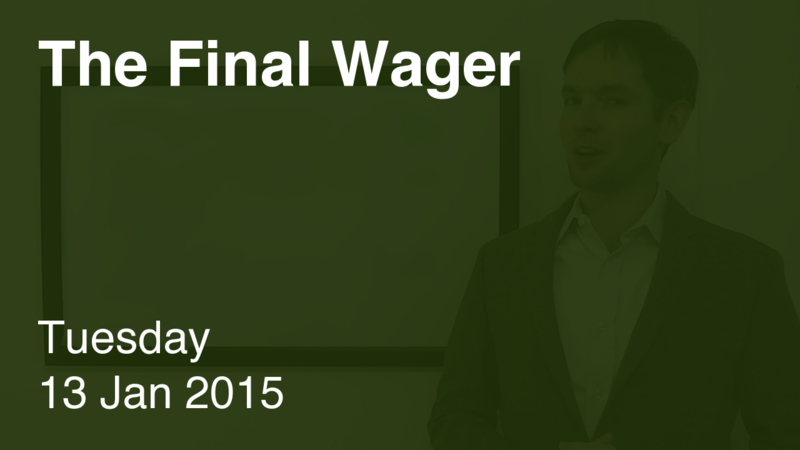 If he’s wrong with that wager, he’ll be left with 4,400, which is more than Abbie has. Abbie should go all in. A better wager wouldn’t have saved Jeremy here, but let’s consider process over outcome. What happens if Abbie wagers 2,201? 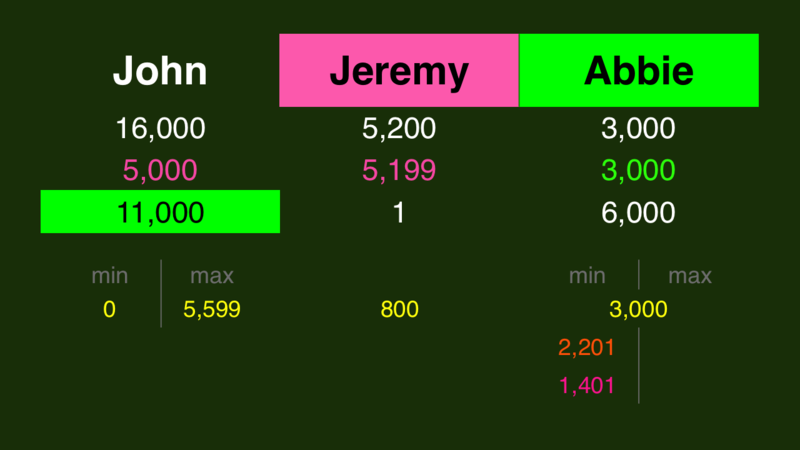 Jeremy will lose no matter what if he misses, for no reason. What is The Music Man? In the last 10 regular games (counting tonight) in which we had three players in Final Jeopardy we have the following result: In 2 cases all three got it right = easy. 3 cases of 1 right + 4 cases of 2 right = 7 ok and 1 case of 0 right = hard. So that’s a “final jeopardy degree of difficulty = just right” score of 70%. I have decided to revise the “average degree of difficulty” calculation to produce a more intuitive score where a higher number indicates more difficulty. You can convert the old degree of difficulty ratings to the new ones by subtracting the old number from 3.0. So, as of today the “average degree of difficulty” score (higher is harder) is 1.30. The “no triple stumper on FJ” streak now stands at 1 day. Plus I was bummed about not getting to 1/2 of John’s score despite having to play very aggressively in dj.